Green Yoga International is now in Europe with the same vision what we started in India: to spread love and yoga by establishing a connection with like-minded souls from Europe to the world. Those who can’t travel to India for some reason now they can access the same training in Spain. If you want to bring your regular yoga practice to next level and to share the same knowledge with your friends or with the world. Our Ashram Shanti Niketan is located on the Eastern side of Mallorca island, which is ideal for yoga Practice. The world Shanti Niketan mean the house of peace. The ashram set up is in a peaceful atmosphere in the nest of a natural typical Mallorcan village, away from distractions and pollution, and away enough from beach and crowd (7 minutes by car from Cala Millor and Porto Cristo with it’s "Coves del Drag"). The entire ashram is equipped with stone buildings, enough place to chill out, to meditate or to be in your own when you required. Our Mallorca ashram is not a luxurious place for sit back and relax, but it is a place for peace, harmony, joy, and happiness in the lap of mother nature. Keeping in mind the best quality of teaching and service we have a capacity for 20 to 25 students to accommodate in our ashram in 2 different options which includes stone rooms and mongolian yurt or glamping tent. The rooms are comfortable, cozy, and will be decorated in a yogic way; glamping tents are eco-friendly, with natural eco toilet and showers. The ashram area is near about 20.000 sq meters of land with a beautiful landscape full of pine, olive, lemon and many other trees which nestles various colorful birds, butterflies, owls, and much more. The ashram is also a house for several small cute tortoise and rabbits who are naturally living there which consider to be an auspicious symbols as per many oriental philosophies. Green yoga India has created the most comprehensive and intense course especially for you. Our aim is to guide and direct the yoga practitioners towards highly professional and qualified yoga teachers in 21 days. The Yoga teacher's course is duly certified by Yoga Alliance which is a certification that is accepted worldwide to teach yoga. Our Yoga certification courses are devised after in-depth study of yoga texts and having years of experience in yoga techniques. We will cover the most important aspect of yoga by building a bridge between East and West, between science and spirituality, between practice and teaching. In our 200 hours yoga teacher training, we teach a Multistyle yoga practice including Hatha yoga, Vinyasa yoga (dynamic flow), Yin yoga, Sivananda, and many other traditions of India. In this manner, the student has an option of choosing their own style of yoga practice and teaching in future. We also emphasize on therapeutic aspect of yoga, so that students who are suffering from disease can join us for their own benefits and also for the help of others. Study the Vedanta philosophy and the most important yoguic text. Learn how to trust: "As you learn to support others, you end up allowing yourself to be supported. This is a fundamental of trust: take control by letting go" (Daniel Scott). Go beyond your limitations and fly! We have redefined a curriculum as per the international standards of Yoga Alliance USA and UK coupled with our own expertise in the field of yoga. The prime objective is to prepare the future teachers physically and spiritually ready to practice and teach by themselves. We will lay down the foundations to become a successful and well-rounded yoga teacher. The main areas that we cover in our program will be will be classified in 5 modules: Yoga teaching techniques, teaching methodology and yogic lifestyle, philosophy, anatomy and physiology, and practice. Inspired by the life and philosophy of the great sage of India Swami Vivekananda (founder of Ramakrisna mission) and Swami Sivananda, Atmarekha decided to dedicate his life for the service to the world through the science and arts of yoga. He specializes in all aspect of yoga like traditional Hatha, Kundalini yoga, stress management for corporates, and the secret of Tantric yogic practice. He is an exceptional motivational speaker, storyteller, and spiritual leader of eastern India. He is also Ayurveda and yoga therapist. Being a classical concert pianist with master degree from Holland Conservatorium and awards in several piano competitions, yogini Veronica left the material world behind and start exploring the world in search of the real meaning of life. She started practicing various forms of yoga in Europe since 12 years ago. Her interest in natural healing treatments drives her to obtain a degree in Holistic western and oriental spa therapies. She is spiritually married to Atmarekha and presently residing in Spain organizing, teaching and running yoga teacher training school in Bali and Spain. Born in Santiago, Chile, Alonso’s yogic journey started in 2003 during his contemporary dance studies. He started practicing Ashtanga and Vinyasa yoga and it took no time for him to fall in love with such a great-powerful discipline. He devoted two years in intense practice and then took up a 360 hours TTC in Yogashala School, Chile. He loves to go deep into spiritual healing and meditation through yoga, aligning the physical body with the mind and soul. Alonso’s commitment is to inspire others to realize their own gifts and powers so as to step fully into their most briliant self. Have you ever dreamed with an island of turquoise-blue waters, secludes coves and calas, white sandy beaches, lush green foliage, dramatic mountains, picturesque villages and a vibrant capital city? Welcome to Mallorca, one of the European top destination chosen by tourist from all over the world. With the third busiest airport of Spain, Mallorca island is full of nature in its maximum expression and outstanding natural beauty. Having more than 500 kilometers of coastline you can choose between more than 200 beaches: you can enjoy the virgin calas with Caribbean-esque seas in the south, cozy sandy coves in the east coast ideal for sailing and snorkeling, or a mixture of beaches and dramatic cliffs with stunning scenery in the west side. Because of the crystal clear waters it’s a perfect destination to practice scuba diving, snorkeling and any kind of water sports. We are what we eat! So a great deal of care has to be taken when it comes to preparing food. In Green Yoga International we have chosen the food as per the requirements of the yoga practitioners. Keeping in mind the nutritional values and following the guidelines of ayurvedic science, we have prepared a wide spread of sattvic food which satisfied not only the taste of tongue but also the soul and mind. We keep in mind the special dietary needs of our students and we provide gluten free and vegan food coming directly from organic shops of our local area. You need to travel to Mallorca airport. From the airport, you can take a direct bus to Manacor city and we will be waiting for you on the Manacor us station and will drive you safe to our ashram. 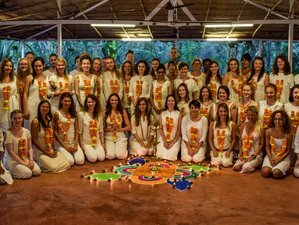 Green Yoga International is a premier yoga teacher training school registered with Yoga Alliance USA and UK, offering multi-style training Europe, Bali & India. Secure your spot in this training by paying 20% of the price.